Next Stop: KNIT CITY 2016! We have a pretty exciting line-up for KnitCity this year of items new to our collection and a few of our old favorites as well. Take a gander through, and check back here tomorrow for our SHOW SPECIAL announcement! Wonderland Yarns creates hand crafted solids and sprinkled yarns in Vermont and is taking the knitting world by storm with their speckled mini-kits. 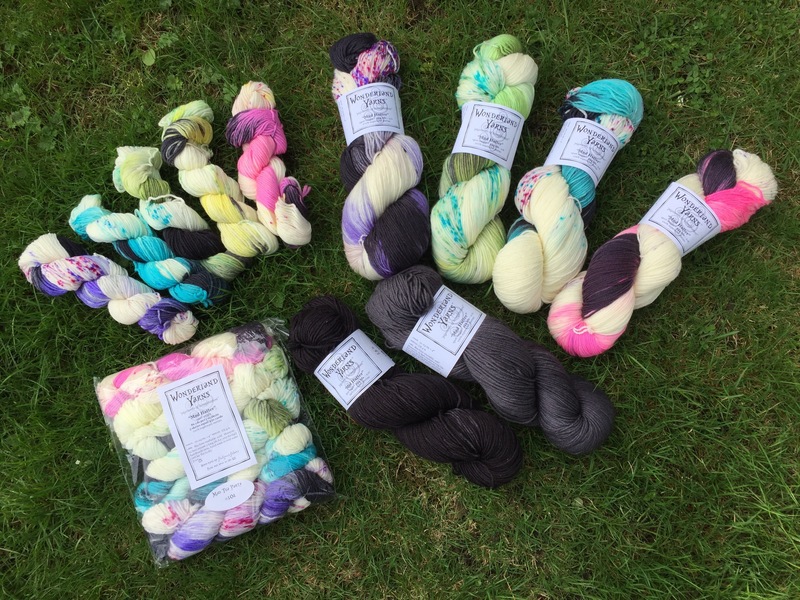 We’ve brought in their Mad Hatter sport-weight rainbow sprinkles in both the 5-colour mini packs and the full skeins, along with complementary neutrals named Too Much Pepper (grey) and Little Bat (black). Limited quality on both of these so be sure to pick these up quick! Melanie Berg’s The Joker and the Thief shawl in Wonderland’s Mad Hatter Tea Party. Check out how the sprinkles work up into eye candy! Three Irish Girls’s Adorn Lux base is one of the softest sock yarns I have ever come across and these three out-of-the-world colourways named Man on the Moon, Rocket Man and Space Oddity just make me so happy. This rainbow ‘dip’ in the dye-job creates a completely different effect than the sprinkles… just a mad dash of colour! So fun to knit with a explosion of colour every few rows. Our store manager, Sarah, just completed her Knit City Sweater in one of these so be sure to check it out at our booth on Saturday. And if rainbow is not up your alley, how about this line of colourways based off the Witches of Shakespeare that have been specialty dyed to force a spiraling pool of colour from MJ Yarns. And they have dyed up a custom Baaad Anna’s colourway to spiral just for us! As noted in earlier this week, we are also featuring a number of local and indie talent such as Mudpunch, Okanagan Knit Co, Spincycle and RoundMountain Fiber’s Drunk Yarns. Dye-your-own Drunk Yarn kits available. Read more about these here. We are now carrying Spincycle’s Dyed-In-The-Wool sport weight yarn which Baaad Anna’s custom paired with other dyers to make more Canadian-market-friendly-priced kits. And of course we have a new batch of Mudpunch‘s hard to find Baaad Anna’s or Bust colourway made-to-order for KnitCity! And some of favorites including Yarn On the House (YOTH), Briggs & Little, Sunflower Knits (Ash Alberg), Americo and more! Pop by to pet some yarnie goodness! We look forward to seeing you! ← Honoring the Camelid! POP UP SALE! We only have the speckled Mad Hatter sets from Wonderland Yarns. Ah, okay – thanks for the quick reply! Any chance I could mail order the mad hatter yarn for the shawl and the spin cycle hat kit? Yes I could help you with that! Give the store a call on Fri (Oct 7th) in regular store hours 11am – 6pm PST and I can get that on its way to you! See you at Fibres West 2017! Lunch for girls day out day two... @bigwheelburger all-dressed tater tots and peaches n cream milkshake! Not coming home anytime soon!